Dr. Schulmeyer graduated from the Cornell University College of Veterinary Medicine in 1986. 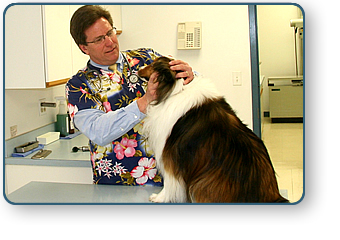 He has been providing veterinary care to the families and pets of the Perry Hall area since 1989. Dr. Schulmeyer was born and raised in Baltimore County. He received a B.S. in Animal Science from Cornell University in 1982. Upon graduation from veterinary school in 1986, Dr. Schulmeyer worked in a mixed animal practice (dogs, cats, horses, pigs, sheep goats, etc.) in Chestertown, Maryland. He returned to the Perry Hall area in 1989 and in 1993 he opened the Schulmeyer Animal Hospital. Dr. Schulmeyer is a member of the American Veterinary Medical Association, the Maryland Veterinary Medical Association and the Greater Baltimore Veterinary Medical Association. Dr. Schulmeyer lives in Glen Arm with his wife, Terri. His two youngest children are currently in college and his oldest son resides in Manhattan. He has coached in the Carroll Manor Lacrosse program for 17 years and has had the opportunity to coach all of his children throughout those years. He still remains very active in youth sports. In 1999 he and his wife started, and continue to run, the Warrior Lax Splash Lacrosse Tournament which hosts over 400 youth lacrosse teams each year and serves as a major fundraiser for the Carroll Manor and Cockeysville Recreation Councils. Dr. Schulmeyer and his wife spend most of their spare time attending their daughter's college field hockey games and their son's college lacrosse games.